After over 30 years in the custom storage industry, Space Solutions continues to develop innovative solutions for every home. Whether you live in a multi-bedroom house or a studio condo, space is always at a premium, and finding innovative ways to get the most out of your space is always top of mind. Here are examples of innovative solutions from 4 recent projects. 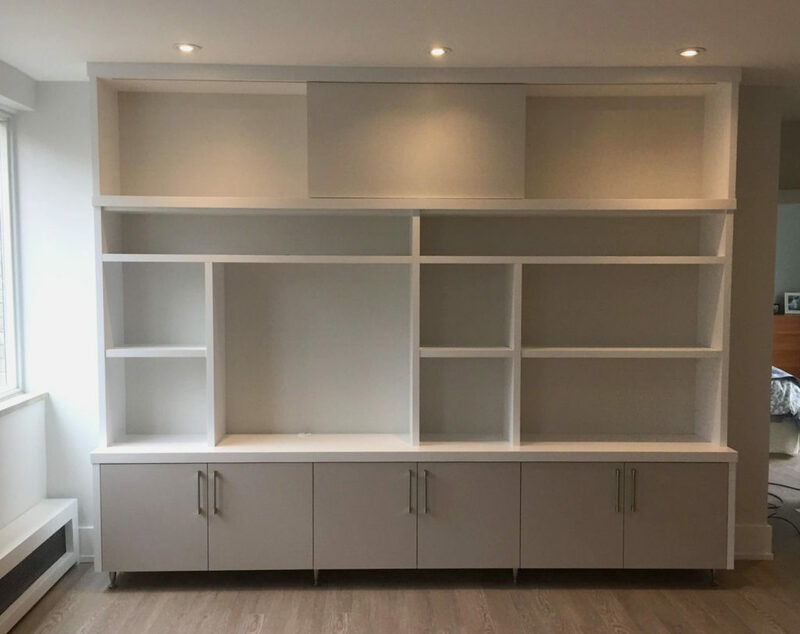 Custom closets have always been the main thing that we do. Some are more elaborate than others, but every project demands the same level of attention that we bring to every project. Custom closets range from simple entrance closets to spacious walkin closets and full-on dressing rooms and dream closets. 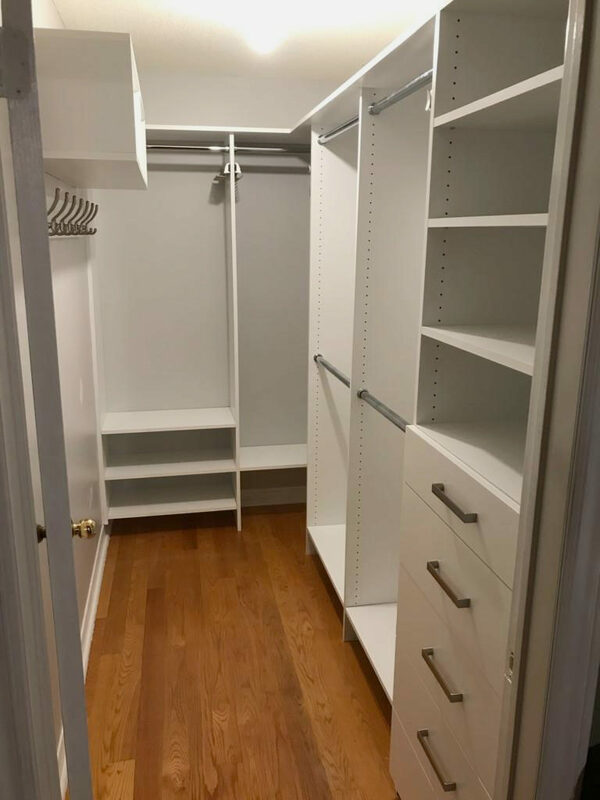 Here’s a recent walkin closet, providing ample long clothes hanging, double hanging, shelf and drawer space – seems simple enough, yes? Looking for the innovative solution in this closet? While space management is important – it’s why we employed hooks and an overhead cabinet on the left wall – the nifty feature is what’s inside the drawers. We’ve installed custom jewellery drawers, with a twist: what looks like a single layer actually conceals a second level below it. By installing the hidden layer within the upper level, and securing it with a lock, you can keep valuables safe and out of sight. Opening the custom hidden jewellery drawer gives the illusion of a single layer of storage. Unlocking the lower box reveals an additional level, to help you keep your valuables secure. Family rooms and living spaces are ideal candidates for custom built-ins, whether for general storage or entertainment, and why not both? The custom wall unit presented here combines classic white melamine with morning dew, one of a series of colours in the gray and taupe family. The white structure will blend in, while the morning dew faces stand out and add interest. We added wide flutes across the cabinet to give it weight, while chrome feet support the lower section. Classic white melamine anchors this structure, offset by doors in morning dew to bring it to life. 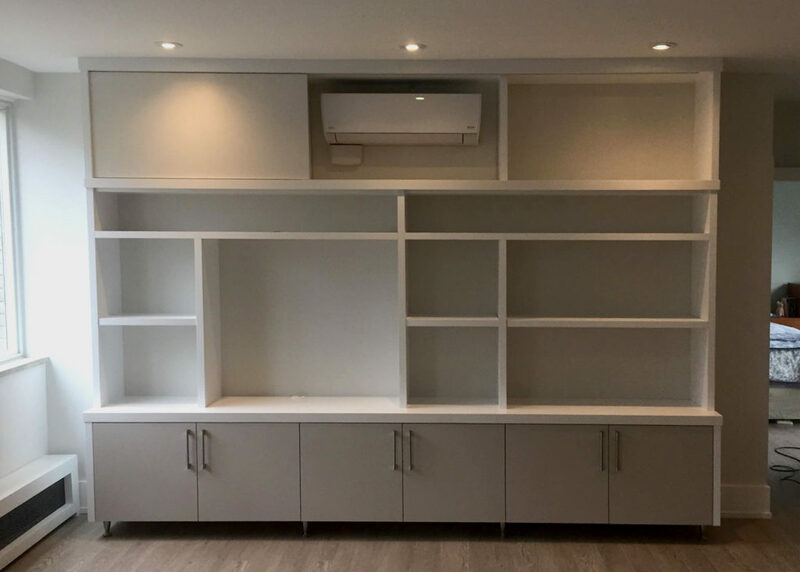 Meanwhile, the client wished to conceal a wall-mounted interior air conditioning unit in their condo. Innovative solution time! We took the custom cabinet to the ceiling, and built around it, and installed a sliding panel in front of it. When they need to use the a/c system, they move the panel to the side. Other times of year, they can conceal it. Sliding panels make great additions to cabinets for a variety of applications, and was the right innovative solution here. An integrated sliding panel, also in morning dew, reveals the hidden A/C unit in the client’s condo. Creating good bedroom storage can be a challenge if closet space is lacking. 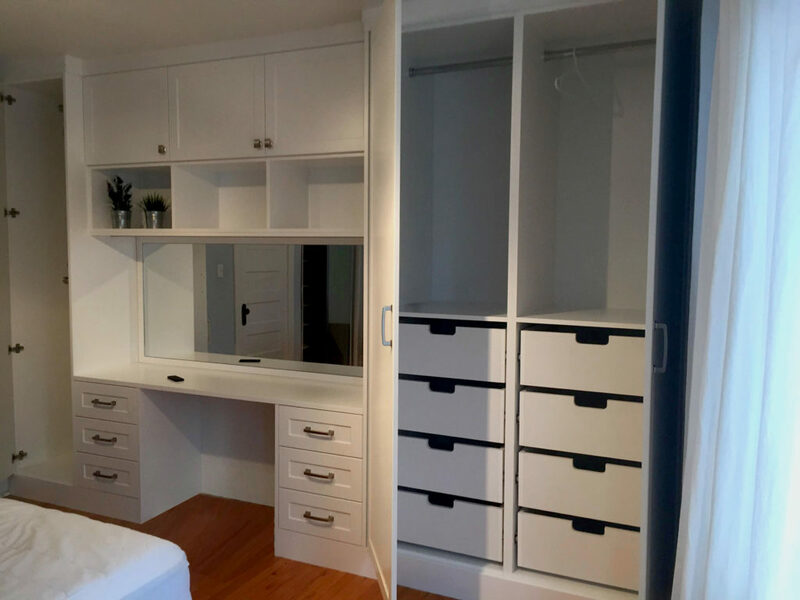 Custom wardrobes can transform your space and provide ample storage. This installation took an entire wall facing the foot of the bed, where a previous fireplace was removed. 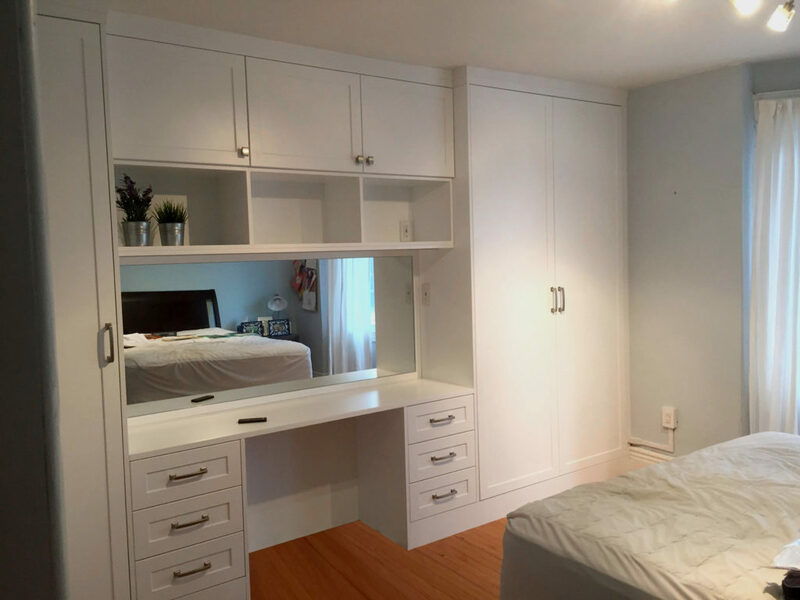 A mirror with lower drawer storage is book-ended here by wardrobes, all fronted with shaker faces for a classic look. Open storage above the desk surface keeps the structure from overwhelming the space, and therefore offers display shelving. A master bedroom wall unit with a vanity mirror and shaker fronts is always a classic design. What if you need even more drawer space? Keeping lines simple and clean is always a good look. That’s why we added drawers behind the wardrobe doors on the right. Having all the drawers exposed would mean more line and more handles, so concealing them is an innovative solution. The scooped-out hand holds mean drawers are still the full depth, while simplifying the look. Additional drawers with scoop fronts are revealed behind the wardrobe doors. Our exclusive sliding door program features European aluminum hardware for durability and a timeless look. Completely custom means we can size our door panels to suit your space, and we’re constantly looking for new insert options. By far the most popular option is white lami glass, a glass product that offers the popular frosted look with additional safety features. 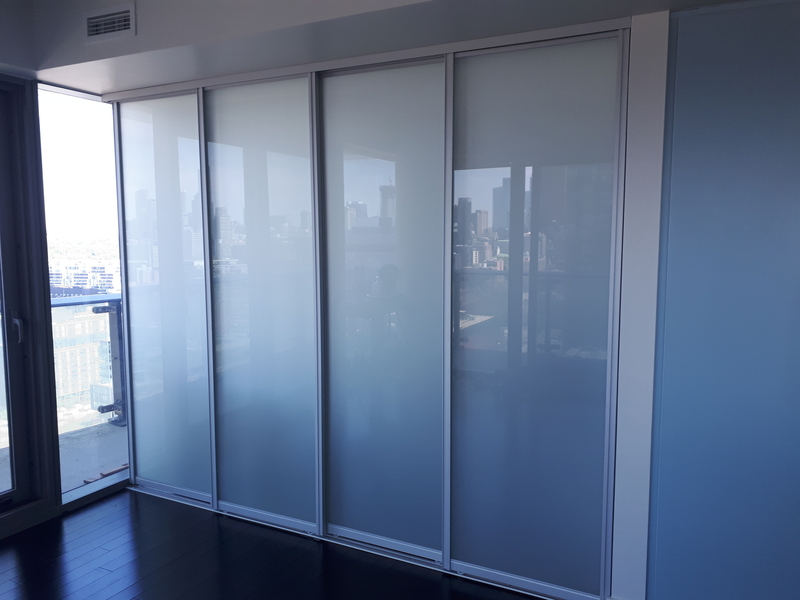 We have installed hundreds of these custom sliding doors over the years, in houses, condos and even offices. The majority of our sliding door installations are for closets, but our doors also make excellent room dividers. White lami glass allows light to pass through while offering privacy. 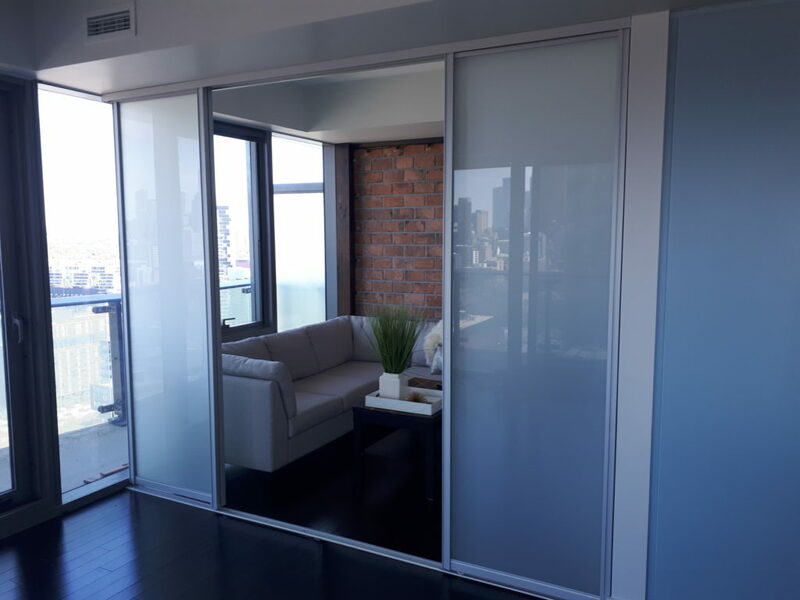 We have converted many condo suites with our sliding doors as a room divider. Whether you need to segment a work space, create a sometimes guest room or even a permanent additional bedroom, our custom doors are an innovative solution that helps you get even more out of your home. Dividing a room allows you to create a guest room, or even a permanent additional bedroom. Did you know that Space Solutions combines Murphy Beds with sofas? Murphy Beds are by their very nature an innovative solution – the addition of the sofa takes it to the next level. Space Solutions has an innovative solution for you! To get started, call us during business hours at 416.322.5575, or after hours, use this handy form to request an in-home consultation!